This is a REPLICA gravestone! When I first visited this graveyard, I noticed right away that this gravestone had an inscription on the back that it was made in 1996. I imagine that the original gravestone was damaged and not fitting for the memory of a young veteran of the Revolution. 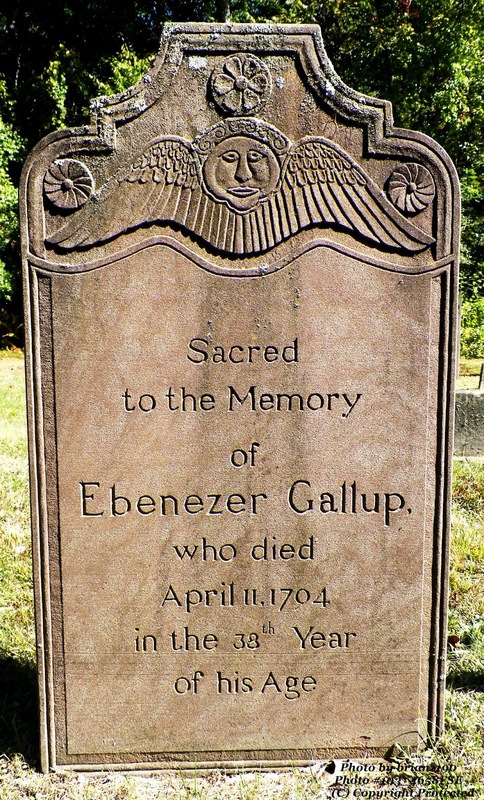 Because of the style of the inscription, it is easy to miss that Ebenezer died on 1794 NOT 1790. He was single. According to the Gallup genealogy (2009) p. 97 he served in the "10th Company, Capt. Abel Spicer, 6th Regiment, Col Samuel H. Parons raised 1775; Capt. John Morgan's Company, 8th Regiment of militia at New York in 1776. Ebenezer was the son of Col Nathan Gallup and his first wife Sarah Giddings.